Teacher, lawyer, politician and company director. Avid amateur fisherman when time permits. Father of Jack and Madeleine Stone. From Bendigo to Wodonga, Melbourne, Alice Springs and onto Darwin. There is nothing remarkable about my journey as it has been matched by many in Australia, arguably the most egalitarian society in the world. Growing up on a public housing commission estate, educated in parish and State schools, the reality is that with determination and hard work you can still be anything you want to be in Australia. My biography follows; a current abbreviated version is available in Archive Documents 'Shane Stone Profile and bio'. Shane Stone was born in Bendigo Country Victoria in 1950. He spent his childhood in Cornishtown near Chiltern and Wodonga. The Stone family lived on the Housing Commission estate, Lawrence Street, Wodonga. He attended Ariel Street State Primary School Wodonga (1956-57), St. Patricks’ Christian Brothers College Albury (1958-62), St. Johns de la Salle College Dandenong (1963-65) and Wodonga High School (1966-68). He is formerly a primary school teacher, barrister and a company director by profession. He is a former Cabinet Minister and Chief Minister of Australia’s Northern Territory. He was Federal President of the Liberal Party of Australia during 6 years of the Howard Government. Until his retirement in lt 2016, Shane Stone served as an independent director of a number of substantial entities in Australia and the United Kingdom. He taught briefly as a primary school teacher before taking up the position of Administrative Officer of the Institute of Catholic Education (a forerunner to the Australian Catholic University). He returned to full-time tertiary study in 1976 at age 26 to study law. Shane is an alumnus of the Australian National University, Melbourne University Law School, Adelaide and Sturt Universities and a former Visiting Fellow Cambridge University. He is a Fellow of the Australian Institute of Management and the Australian Institute of Company Directors. He is also a Life Member and Fellow of the Australian College of Educators. He is Fellow of the Financial Services Institute of Australasia and was made an Honorary Life Member of LAWASIA in 1996. Before reading at the Victorian Bar with Richard Stanley he served as Associate to the late the Honourable Sir Edward Woodward AC OBE in the Federal Court of Australia. He signed the Roll of Counsel as a member of the Victorian Bar and was also admitted in NSW, Tasmania, the NT and High Court of Australia. As the Northern Territory’s First Law Officer he received a Commission as Queens Counsel in 1997. Post politics Shane retired from the legal profession to pursue his business interests. In June 1999 he was elected Federal President of the Liberal Party and served during the Howard Government’s successful 2001 federal election campaign and the historic fourth general election victory on 9 October 2004. Post politics over many years Shane Stone committed pro bono to democracy building and reform through the Australian Political Parties for Democracy Program administered and audited through AusAID (Australia’s Overseas Aid Program). He was active in the International Democratic Union (IDU). He also served on the Expert Panel on Political Parties of the International Institute for Democracy and Electoral Assistance (IDEA) an IGO based in Stockholm Sweden. He is a former member of the Standing Committee of the International Conference of Asian Political Parties (ICAPP), a forum of political parties of Asia-Oceania countries. In recognition of his activities and work through the region Shane was conferred Panglima Gemilang Dariah Kinabalu, styled Datuk with the post-nominal PGDK (Commander Most Honourable Order of Kinabalu Sabah Malaysia) and the Bintang Jasa Pratama (Order of Service Republic of Indonesia). He was made a Life Member of the Philippines Australia Business Council in Manila in 1999. He was the second Australian to be accorded the distinction at the time. The same year he was awarded the ALKI Award by the Justice for Cyprus Committee. In recognition of his support of the Orthodox and Coptic faiths, he has been conferred a Knight Grand Cordon of the Order of the Ethiopian Lion and Knight Grand Cross of the Imperial Order of the Holy Trinity by the Ethiopian Crown Council. He is a Life member of the Greek Orthodox Community of Northern Australia, the Kalymnian Brotherhood and Cypriot Community of Darwin. He was conferred an honorary citizen of Kalymnos in the Greek Dodecanese Pothia in September 1995. He is Patron of the Italian Club of Darwin. Shane’s not for profit activities include the Australian Children’s Television Foundation (1999-2008) and the Defence Reserve Support Council (Chairman 2000-2008). He is the ongoing National Patron of the Australian Dragon Boat Federation (a sport he helped pioneer in Australia). 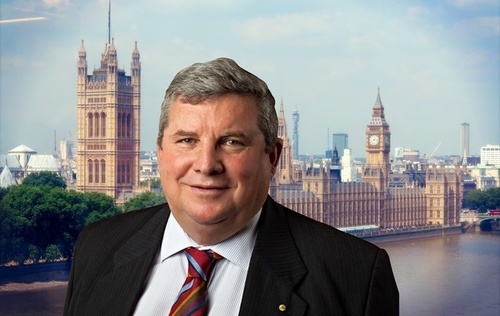 Shane was National President of the Order of Australia Association (2010-2013) and served as Chairman of the Duke of Edinburgh’s Award in Australia March 2012 to April 2018. He remains a financial supporter of the Award in Australia. ‘For service to politics contributing to strengthening Federal-State-Territory intergovernmental processes, to furthering the bilateral relationship between Australia and the Asia/Pacific region, and to the oil and gas industry’. Shane Stone is a Knight of Magistral Grace of The Sovereign Military Hospitaller Order of St. John of Jerusalem, of Rhodes and of Malta an Order of the Catholic Church. He has actively engaged the charitable works of the Order, in particular, the Coats for the Homeless program. He is a retired Reservist dating from 1969 (retired and dined out 2016). Shane gained his commission as a seaman officer. He subsequently transferred to Royal Australian Navy Legal Branch and in 1995 was the first Australian Navy Officer to attend The Lauterpacht Centre of International Law Cambridge as a Visiting Fellow. He retired as Head of Legal Panel RANR Northern WA & NT with the substantive rank of Commander. He is a recipient of the Reserve Force Medal, the Australian Defence Medal and Centenary Medal. In 1999 Shane was accorded the appellation the Honourable for life by HM Queen Elizabeth II of Australia on his retirement as Chief Minister. He was granted his Armorial Ensigns by the United Kingdom College of Arms on Australia Day 26 January 2008. Shane Stone is the current Chairman of the Order of Australia Council, the penultimate authority that recommends to the Governor-General Australia’s civil honours list. He is married with two adult children and is a resident of Darwin in Australia’s Northern Territory. For an expanded history and background read My Story. There are also extensive Images and Documents accessible through the Archives. For current up to date resume see Archive Documents ‘Shane Stone Profile and bio’.